The Power Ledger Platform is an Australian-based environmentally conscientious company that aims to create a decentralized peer-to-peer energy sharing platform based on the Ethereum blockchain that allows users to sell and purchase excess energy directly to and from one another. This can apply to either individuals or larger institutions. By doing so, they hope to not only empower consumers to lower their energy costs, but to also enable them to access more sustainable and autonomous sources of energy from Application Hosts (service providers). The platform will provide a transparent and secure ecosystem through which individuals can transact Power Ledger’s POWR tokens for an Application Host’s excess power, as well as negotiate contract terms. The smart contracts will also provide an autonomous method of contract arbitration, escrowing and fulfillment between parties. Consumers are looking for cheaper, more reliable and self-sustaining means of acquiring energy, especially in places such as America where major powerplants have been destroyed due to hurricanes and other phenomena. The interest in adopting Distributed Energy Resources (DER) is especially evident in countries such as Australia where there are more private individuals adopting solar photovoltaic systems (PV) than transmission networks since 2011. They also predict a higher adoption rate of electric vehicles in the future, which will also increase demand for alternative electrical charging sources. Furthermore, cheaper, self-generating power sources are especially relevant for developing countries, where millions of people still do not have access to electricity. The Power Ledger Platform is intended for global adoption, and is therefore designed with the scalability to handle mass use, customized contract terms and use cases. The platform operates on two blockchain layers, namely a public layer and consortium layer, as well as a number of other intermediary layers. is where POWR tokens can be transacted on external exchange platforms. These interactions are completely autonomous form the Power Ledger Platform. forms the basis for communication and transactions across the other platform layers. 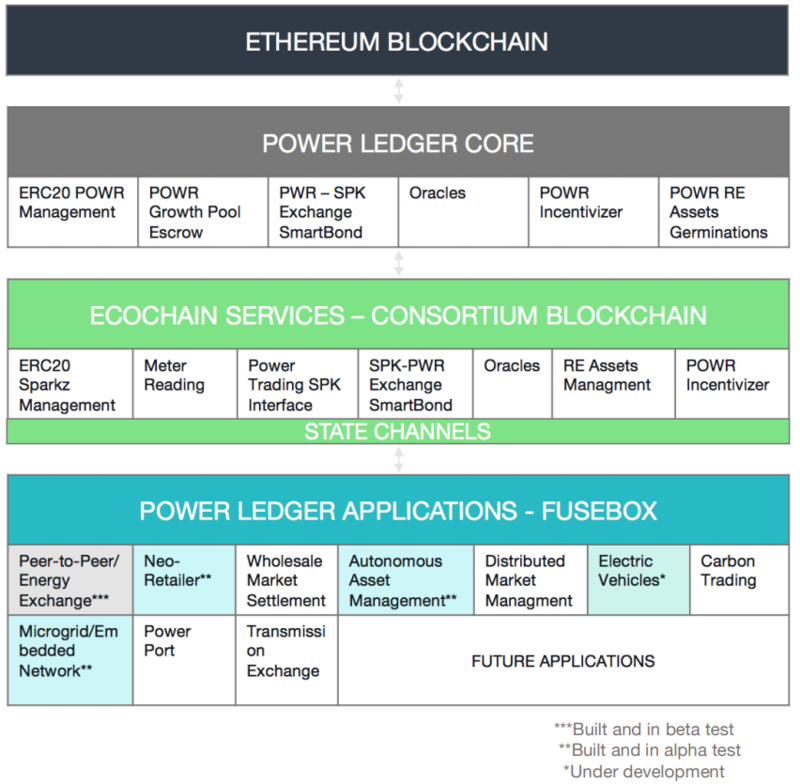 Ecochain – This is the consortium blockchain is in development by Power Ledger for their private use as a fee-less Ethereum ecosystem. It is planned to be responsible for functions such as the creation and issuance of Sparkz, as well as data analyses, management and storage. The Power Ledger Core is the layer responsible for the initiation and implementation of public POWR smart contracts such as token transactions, customer reward programs, AI monitoring of market prices and for implementation when transacting between fiat currencies, Sparkz and POWR. State channels – allows for off-chain transactions through the systematic implementation of multiple smart contracts. Such methods can only occur with the full agreement of all parties involved. FuseBox – this is the application layer of the platform. It is the interface through which users engage with the platform and through which all smart contracts and transactions are initiated. Peer-to-peer transactions – users can perform direct transactions by means of smart contracts on the Power Ledger Platform. This system will allow for both parties to negotiate the terms of the transaction, as well as providing transparency and autonomous transactions between them, with the smart contract automatically ensuring that the terms of the agreement are met. The contract terms can also be determined directly between the users, thereby decreasing transaction and other intermediary costs, although there may still be taxes incurred as per local law. Neo-Retailer – retailers may also use this platform as a basis for selling their energy based on the Sparkz smart contract system described above. Automated power ports – Automatic ports can be set up that allow for self-service transactions to occur, whereby consumers can purchase electricity as needed in remote location without the need direct interactions with the second party. For electric vehicles, this would be the equivalent of a self-service gas station. Automated data management – the Power Ledger Platform can be used to monitor power usage, as well as record and transfer data, such as metering, access and distribution rights, real-time fulfillment of transactions, account authentication and balance verification. 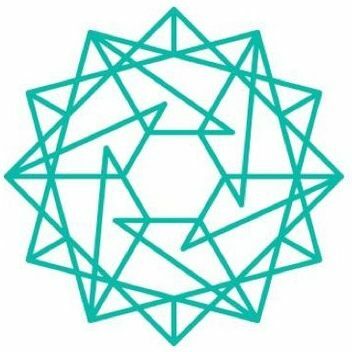 Power Ledger has opted to use two operating tokens as a means of ensuring market flexibility within its ecosystem. Both tokens are available and actionable on all layers of the Power Ledger Platform. POWR tokens can be purchased with ERC20 Sparkz tokens and are used to initiate and complete smart contracts on the platform. In turn, Sparkz smart contracts can only be for fiat currencies and can be traded between users who are either located in the same country or are using the same currency. This is due to Sparkz prices being set according to each country’s local exchange rate, whereas POWR token value will be based on their value on crypto-exchanges. Once Sparkz have been escrowed against POWR tokens, they are withheld by the platform until the terms of the smart contract are complete, at which time they will be released to the service provider as remuneration for their services. There will only ever be a total of 1 Billion POWR tokens in circulation, whereas Sparkz tokens are created as required and burned when redeemed. The prices are kept separate in order to create stable electricity costs within each country. Power Ledger will accomplish this by setting each SPARKZ price at a 1:1 ration to the local currency. In this way, electricity prices will be determined purely by local prices, without their being influenced by the POWR market value. The Sparkz/POWR exchange rate will fluctuate based on POWR’s market demand. As of January 2018 – Power Ledger partnered with Tech Mahindra in India to test its application on microgrids across their campuses. 17 November 2017 – The city of Fremantle in Western Australia is awarded a $5.68 Million AUD government grant towards the implementation of a trial of the Power Ledger platform. 10 November 2017 – Power ledger partnered with the Liechtenstein Institute for Strategic Development in order to introduce their platform in Europe.